Photography by James Bareham. Video by Becca Farsace, Phil Esposito, Vjeran Pavic, Brennan King, and Andrew Marino. Samsung just announced the 10th iteration of its flagship Galaxy smartphone, the Galaxy S10 and S10 Plus. I had a brief chance to poke around the S10 and S10 Plus ahead of today’s announcement, and here’s what you should know: these are unmistakably Samsung phones in that they follow the Samsung playbook of maximizing every possible spec, but they do so in a way that seems more elegantly integrated than the last few Galaxy iterations. Also, they look really nice. This S10 pair succeeds last year’s Galaxy S9 and S9 Plus, and they are also accompanied by a new Galaxy S10E model. All three phones will be available for preorder starting tomorrow, February 21st, and they will start shipping on March 8th. In addition to all four major US carriers, the S10 family will also be available unlocked from Samsung and other retailers, starting at $899.99 for the S10 and $999.99 for the S10 Plus. 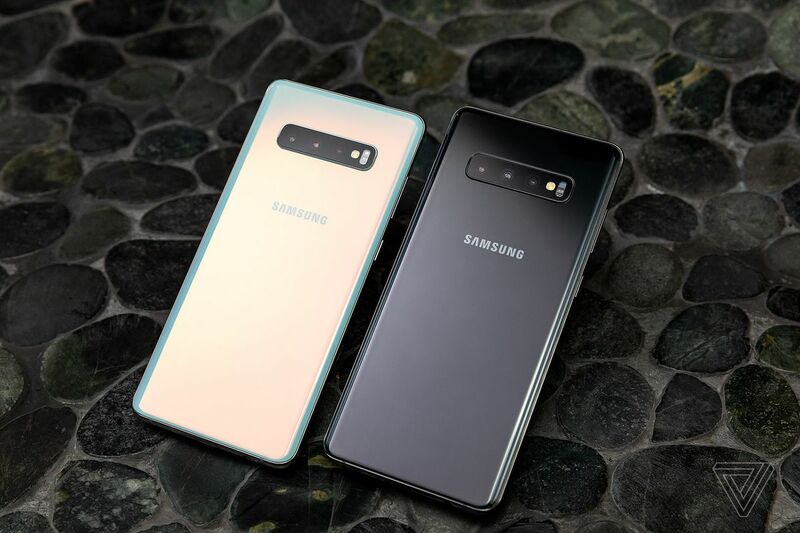 We have a whole other article dedicated to the S10E, but for everything concerning the S10 and S10 Plus, keep reading. Galaxy S10 Plus (left), Galaxy S10 (right). Continuing Samsung’s years-long effort to eliminate bezels and provide the most screen possible in a device you can hold in your hand, the S10 and S10 Plus’ design centers on 6.1-inch and 6.4-inch screens, respectively, with nary a bezel around them. Both models have considerably larger displays than the S9 and S9 Plus, but their overall dimensions are just a smidge larger than before. In fact, the S10 Plus is actually slightly shorter than the S9 Plus, despite having a 0.2-inch larger display. 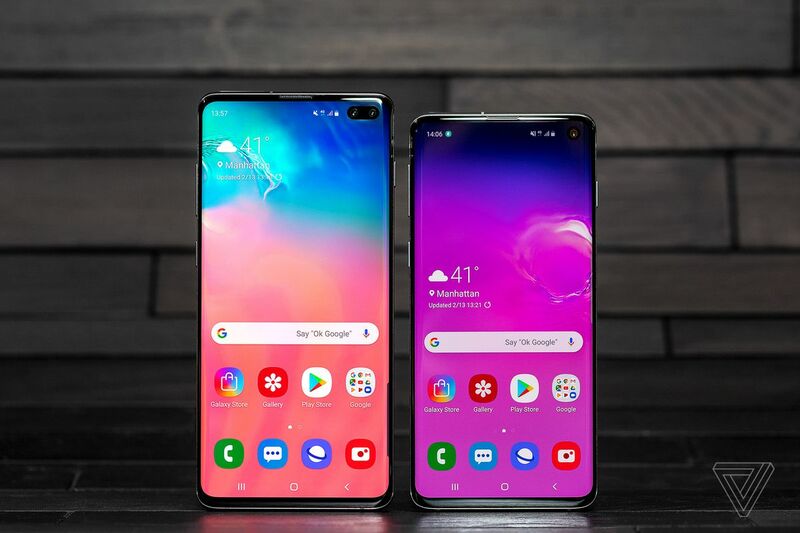 Still, both of these phones are big, and if you’re at all put off by that, the S10E is more likely up your alley. Aside from size, the displays on both models are identical: 1440-pixel wide 19:9 OLED panels (with Samsung’s “Dynamic AMOLED” branding) with HDR10+ certification. Both have curved sides that meld into the aluminum frame and make it easier to hold. They are as bright, colorful, and vibrant to view as any prior Samsung screen, and based on what I’ve seen so far, I wouldn’t be surprised if Samsung continues to have the best displays available on a phone this year. The S10 screens have two other special features (one you can see and one you can’t). 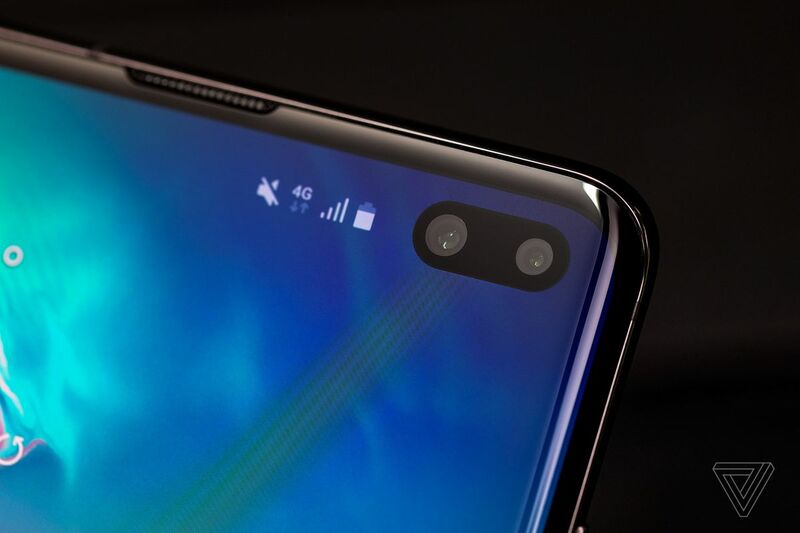 The one you can see is the new hole-punch cutout for the front camera, which allows Samsung to avoid a notch-style design and still have a front-facing shooter. The S10 Plus has a wider punch for the two cameras on its front; the S10 makes do with a circular one. 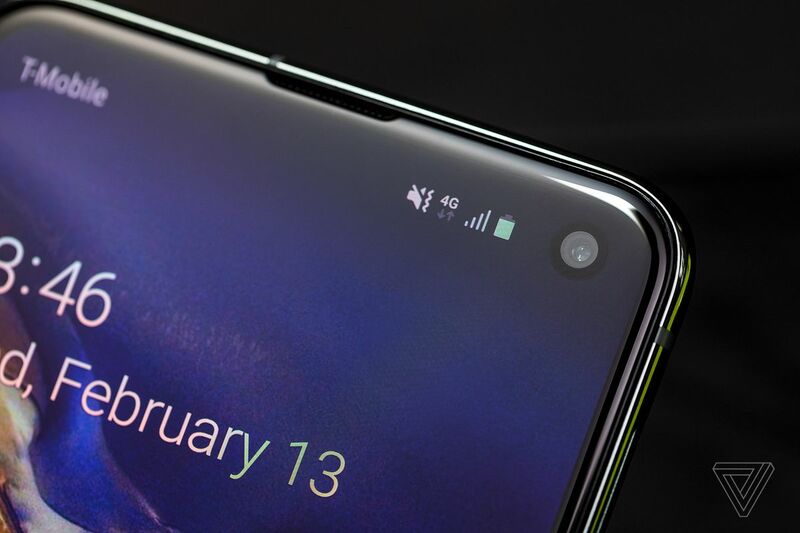 I’m still not convinced that hole-punch displays are any better than a notch, but given how many people seem to irrationally hate notches, Samsung is here for them. The feature you can’t see is the ultrasonic fingerprint scanner that’s embedded below the screen, which replaces the traditional capacitive scanner that used to be found on the back of the S9. Samsung claims this scanner is the “most advanced” one on the market, and it’s more reliable, harder to spoof, and generally better performing than the optical-based scanners used in the OnePlus 6T and other phones. I was only able to test the new scanner briefly, but it did work remarkably well at reading my thumb and unlocking the phone quickly. My colleague Vlad Savov has more to say on it here, and we’ll be doing more extensive testing in our forthcoming review. One downside to an ultrasonic fingerprint scanner is that it can’t work through thick screen protectors, so Samsung is certifying certain third-party screen protectors that have been tested to work with the S10. We’ll have to see what those look like when they are released, but the short of the matter is: don’t expect many tempered glass options for the S10. In terms of build quality and feel, these are perhaps the most premium Samsung phones ever released. They are lovely to hold and even more lovely to look at, even though they are big and perhaps unwieldy to use in one hand. Samsung is still using aluminum for its frames, which doesn’t have quite the same appeal as the stainless steel that Apple uses on the iPhone XS and XS Max. The S10 Plus will be available with a ceramic back option, upping its aesthetic and tactile qualities. The S10 and S10 Plus both have the same rear camera systems: a three-lens array that provides wide, super wide, and telephoto framing options at the touch of a button. The wide and telephoto cameras are the same ones that were found on last year’s S9 Plus, with 12-megapixel sensors and optically stabilized lenses. The telephoto lens has an f/2.4 aperture, while the wide camera has the same aperture-switching system that debuted last year and allows for switching between f/1.5 and f/2.4. The new ultra wide camera offers a 123-degree field of view through an f/2.2 lens and has a 16-megapixel sensor. Unfortunately, it is a fixed-focus lens that lacks autofocus. But at those super wide angles, that shouldn’t be that much of a problem. The S10 is not the first phone to offer a triple-camera system — LG did it on the V40 last year — but it’s still an intriguing proposition: here is a whole camera bag full of lenses built into the back of your phone, and you can switch between them on the fly. We will have to see how well they perform in practice, but in my limited time using the S10 ahead of today’s announcement, switching between the cameras was quick and easy in the camera app. I do wish Samsung had pushed the envelope with its actual sensor technology more than it seems to have done — we’re seeing numerous phones come out this year with staggering 48-megapixel sensors — but I’m holding out hope that I’ll be pleasantly surprised by its performance once I have more time with it. There are a couple of new software features related to the camera: an expanded set of “Scene Optimizer” selections that can automatically identify 30 different scenes and optimize the camera’s settings for them, and a new “Shot Suggestion” feature that can help fix poorly framed photos. For video recording, the S10 supports 4K UHD recording on both the front and rear cameras, and it can record in HDR10+. There’s also a new “super steady video” mode for smoother footage. The iPhone remains the leader when it comes to video recording, but we’ll see if Samsung has been able to make up any ground this year. 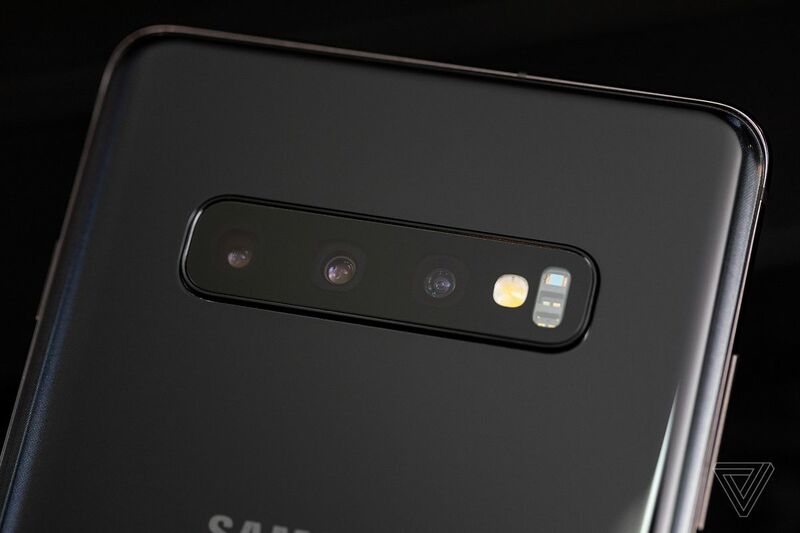 The S10’s front camera has been upgraded to 10 megapixels, with an f/1.9 aperture lens and dual-pixel autofocus. The S10 Plus has a second, 8-megapixel front camera that it uses for improved depth sensing and portrait modes. Unlike the Pixel 3, the S10 Plus’ second front camera does not offer a wider field of view; it is used solely for depth effects. Samsung says the standard S10 will also have portrait mode features, though they will not be as “advanced” as what’s on the S10 Plus. Inside, the S10 and S10 Plus have the Snapdragon 855 processor (in the US, other regions will see a Samsung Exynos processor), between 8GB and 12GB of RAM, and up to 1TB of storage in the S10 Plus. Both models start at 128GB of storage and have support for microSD card expansion as well. Battery capacities have gone up since last year — it appears Samsung has fully shaken off its fears of high-capacity batteries following the Note 7 debacle in 2016 — with the S10 featuring a 3,400mAh cell and the S10 Plus featuring a massive 4,100mAh battery. Both models support fast wired and wireless charging, and they have the ability to charge a second device, such as the new Galaxy Buds wireless headphones, through their back panels. Unsurprisingly, the S10 and S10 Plus’ feature lists don’t end there: they also have IP68 water and dust resistance, 3.5mm headphone jacks, and support for Wi-Fi 6, Bluetooth 5, and 2Gbps LTE (but not 5G; that’ll be in another S10 variant arriving later this year). The S10 is launching with Android 9 Pie and Samsung’s new One UI interface, which just recently arrived on the S9 models. And, yes, it still has a Bixby button that launches Bixby and does Bixby stuff. Samsung says it has developed new routines for Bixby, so we’ll have to see how well they work in practice, but it also seems like you’ll be able to remap the button to something more useful. Finally. Overall, the S10 and S10 Plus seem to be solid, if a bit iterative, updates on what is very likely to be the most popular Android phone this year. They aren’t as groundbreaking or ahead of the pack as say, the Galaxy S8 was two years ago, but they take Samsung’s strengths and push them further. We will have to see how all of these changes work out in practice when we have a chance to properly review the S10 and S10 Plus, but for now, things are looking promising.